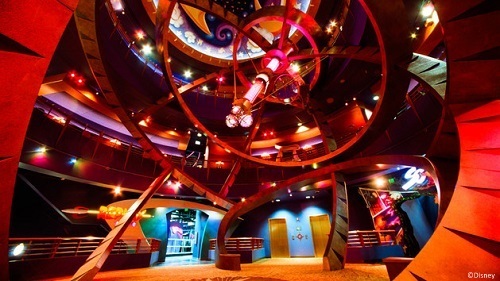 POSTED: Mon, 06/23/2014 - 05:00 | POSTED BY: Traci C.
When the skies open up, why not plan a visit to DisneyQuest? This indoor interactive theme park features CyberSpace Mountain, Pirates of the Caribbean: Battle for Buccaneer Gold, and the Virtual Jungle Cruise along with other virtual experiences. Guests can also visit the Animation Academy or become a human pinball in the Mighty Ducks Pinball Slam. If old school video games are more your style, DisneyQuest's Replay Zone features classic video games including Ms. Pac-Man, Donkey Kong, Frogger, Tron and more. If your park ticket doesn't include the "water fun and more" option you will need to purchase admission to DisneyQuest. This high-tech adventure is best on days where rain looks like an all-day event. Spend a rainy day at DisneyQuest! If the rain looks like it might not last all day, a game of bowling might be the ticket to some rainy day fun! 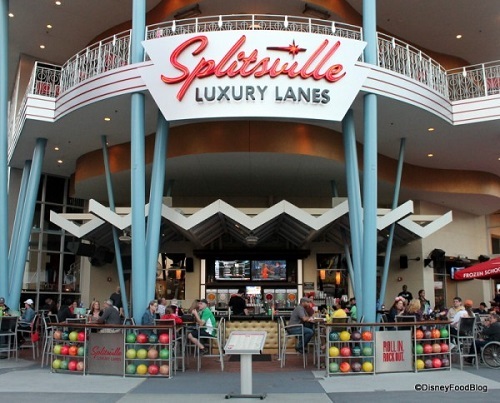 Head over to Splitsville Luxury Lanes in Downtown Disney and challenge your family to a game. You can reserve a lane at the Splitsville Lanes website and prices start at $15 per person on weekdays from open until 4 p.m.; after 4 p.m. and on weekends the price goes up to $20 per person. After your game of bowling we suggest sticking around for a delicious meal! Our friends at the Disney Food Blog reviewed the food at Splitsville and it's safe to say that there is something on the menu for everyone. Enjoy a game of bowling on a rainy day. Now let's say it was a gorgeous day and then the skies opened up and your plans of watching a parade at the Magic Kingdom are all wet. 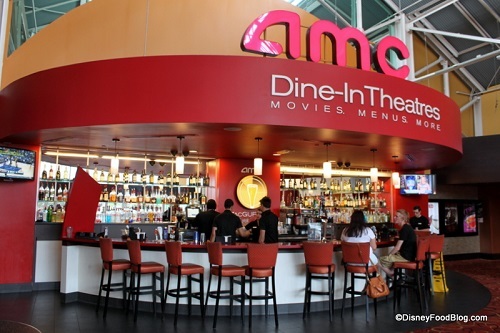 We think watching a movie is a great alternative and you can do that at the AMC 24 Downtown Disney Dine-In Theater. As an added bonus you can also eat dinner while you enjoy a movie! Check out the Disney Food Blog's review of the AMC 24 Dine-In Theater. The Dine-In experience is a perfect way to spend a rainy day or night at Walt Disney World, but if you prefer your movie without a meal the AMC 24 also has "non-dine-in" theaters and you can just enjoy movie popcorn with extra butter and a box of candy. Either way, you're still having fun despite the rain. Sometimes you still want to be outside despite the rain and we don't blame you. After all, it is your Disney vacation. So if it's not storming and there's no severe weather on the way, we say bust out the ponchos and umbrellas and head to one of the theme parks. You might find the crowd level to be a bit lower on rainy days which is always nice, especially in the summer months. And the parks (especially the Magic Kingdom and Epcot) have so many indoor attractions it'll be easy to dodge the raindrops as you walk around the parks. Since you're already a little wet, you can always add a water ride to your plans. 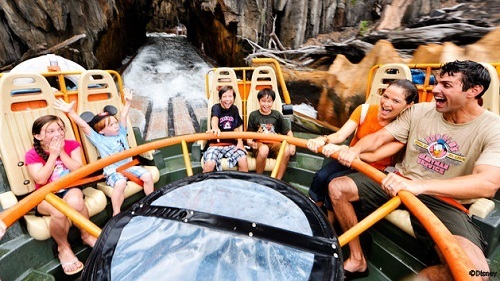 We suggest Kali River Rapids at Disney's Animal Kingdom. You're likely to get soaked on the ride, but who cares when it's raining! 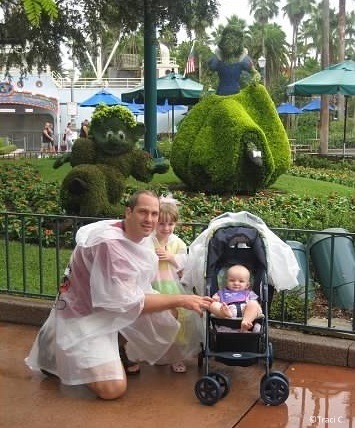 As with all rides and attractions at Disney, there is no guarantee that they will run the ride in the rain. Always check with the cast members at the parks. And if there's lightning it's a good bet the rides will be closed. Enjoy a water ride in the rain! When it comes to visiting Disney (whether it's the "rainy season" or not), it's always a good idea to pack your ponchos, even if the sun is shining when you leave the resort in the morning. Don't spend the big bucks to buy a poncho at the parks either; instead buy them at your local dollar store before you leave home. You'll save a lot of money that way. You might also want to think about shoes that are "wet weather friendly," as no one wants to walk around in squishy shoes and socks all day. And remember...a rainy day at Disney is better than a sunny day at the office. Thanks to our friends at the Disney Food Blog for use of their photos. What is your favorite way to spend a rainy afternoon at Walt Disney World? Leave us a comment and let us know! We just walk around as usual if it is raining. I tend to wear quick-drying sundresses or shorts with Crocs (hey--you might think these shoes are ugly, but they are comfortable and can simply be dried off after the rain or wet ride!). We don't even bother with ponchos. We are from Florida, so we are used to the rain. Sometimes an unexpected downpour is a welcome break from 98 degrees and bright sun! We get a plastic bag to hold the camera and other items that should not get wet, and then we just amble along and let ourselves get soaked! WE just power through no ponchos or anything. We always keep a few zip lock bags on hand for phones and wallets but other then that let it rain we will dry off when we get back to the resort and always have an extra pair of shoes back there as well. My wife and I are the luckiest Disney visitors ever. We only have 48 days in the world since our first trip in 2002. In all those days though we have had 3, yes 3, light showers, all of which lasted about 15 minutes. We were on the bus to Magic Kingdom for one and on the backlot tour for another. Neither time did we get one drop wet. The other time we were walking to the jungle cruise. We just kept walking and got a little wet. We were dry by the end of the jungle cruise ride. If we figure out how to do it on purpose, we will sell the secret.